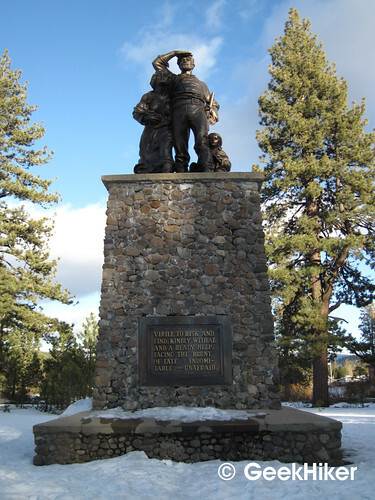 The story of the Donner Party is one of those tales of Gold Rush California that’s well known outside of the state. Unfortunately, what’s known about the Donner Party pretty much always focuses on one thing: cannibalism. It usually boils down to “they ate each other!”, followed by an audible gasp. Like most stories from history, there’s more to the tale than the simplified legend that’s known so far and wide. A great place to find out about that story, and a lot of other history besides, is to spend a day up in the high Sierra’s, just off a busy interstate highway at Donner Memorial State Park. 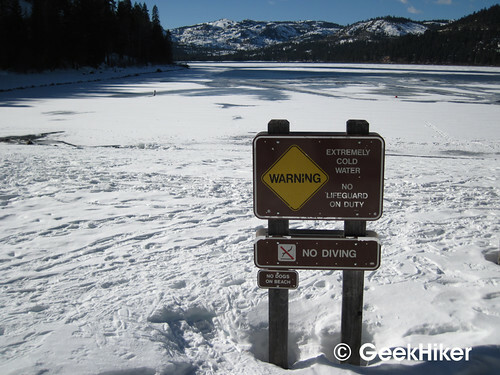 I traveled to Donner Memorial State Park last weekend for a snowshoe hike. During the summer, the park is a busy place, with a 150+ site campground, picnic areas, swimming and fishing, hiking trails, and a visitor center. The park quiets down quite a bit in the winter where we saw, at best, five or six cars in the parking lot during the weekend day. Luckily, the parking lot is plowed and the small visitor center is open during the winter months (10:00 am to 5:00 pm, closed Tuesday and Wednesday from September to May). Inside, you’ll find an old (and, according to the docent, embarrassingly bad) film about the Donner Party, and some dated exhibits about the history of the area and emigrant travel and, of course, information on the Donner Party itself. Fortunately a brand new visitor center, about four times the size of the current one by the looks of it, is scheduled to open in the fall of 2013. The story of the Donner Party of 1846-47 itself is truly a tragedy, one that’s easy to forget when breezing along Interstate 80 in heated comfort at 65 miles an hour. The fateful decision the party made was to take the Hastings Cutoff, a supposed shortcut to California that took the party through the Wasatch Mountains and past the Great Salt Lake in Utah. Unfortunately the delay caused by the “shortcut” left the party, who’d hoped to arrive in California in September, attempting to cross the Sierra Nevada Mountains in November. 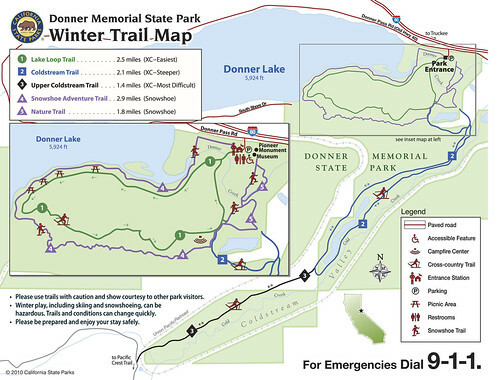 Today the location is memorialized as Donner Memorial State Park. There one can find a memorial statue, which sits atop a 22-foot pedestal indicating the depth of the snow during that fateful winter of 1846-47. During the summer, the park is busy with campers and day-trippers. 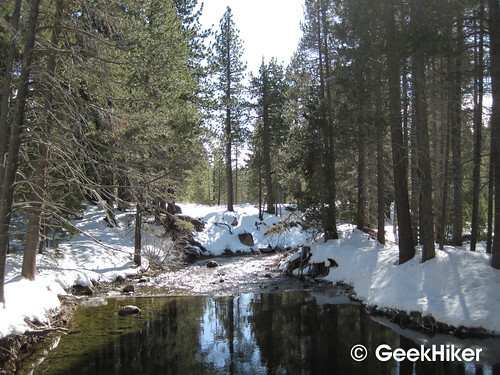 During the winter months, most of the park is closed to cars, and rangers mark cross-country ski trails and snowshoe routes. (Note: on my trip there were relatively few markings to be seen, mostly pink ribbons on trees. However, both trails (unless there is fresh snow) are easily seen, and the noise of the nearby highway makes orientation easy.) A map is available in the visitor’s center showing the winter routes. To start the Snowshoe Adventure Trail, head west from the parking lot past the summer-only ranger booth, which is the limit of parking-lot plowing. Starting up the trail, you’ll drop down immediately and cross the outflow from the lake. 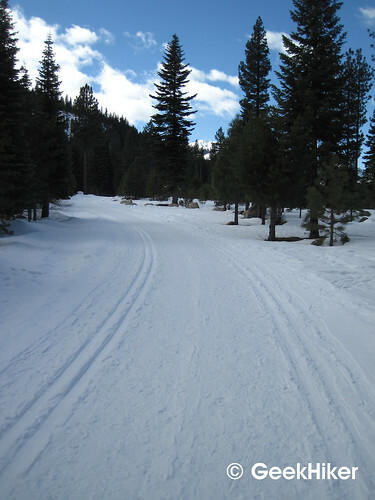 Turning right, the cross-country ski trail follows the park road towards the lake. Snowshoe travelers can turn off this trail to the right, heading down towards the outfall stream and, following it westward, eventually leading to snowshoeing along the lake shore. 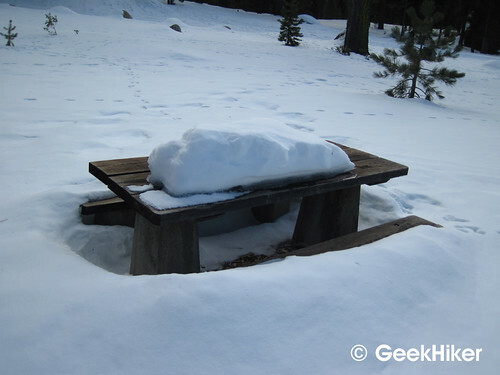 Along the lake shore, you’ll pass through the snowed-in picnic areas and see informational signs from the nature trail. Eventually, the trail will curve around to give a wide view of Donner Lake. Donner Pass, still used today by the modern interstate to cross the mighty Sierra Nevada, can clearly be seen to the west. 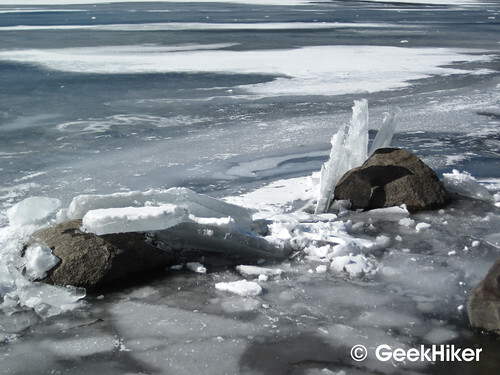 Ice may be on parts of the lake leading up to the shore, but the State Park warns that it can be deceptively thin. 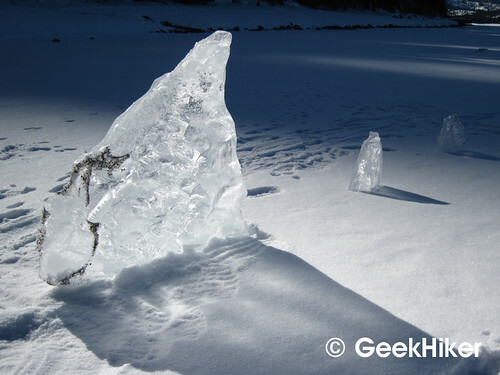 Accidents happen every year when people attempt to ice skate on the lake, and it is wise to remain safely on the shore. Yes, the water might be a little chilly this time of year! Continuing along the path to the left the trail climbs a bit back to the road and away from the lake. Crossing over the cross-country ski trail, the snowshoe path parallels the road through the forest. If markings on the trees are unavailable, simply continue east (keeping the interstate on your left). 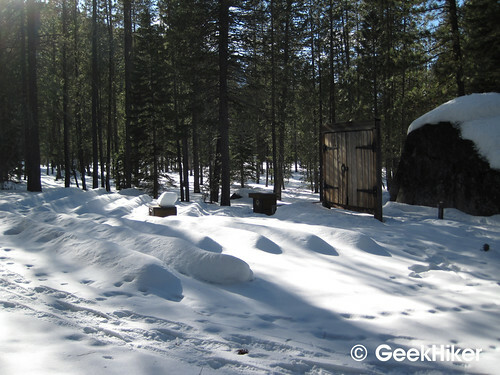 The trail continues through the large campground, with fire rings and bear-boxes poking out from the snow. A short detour even takes you to the wintery campfire circle, where rangers lead talks and show slideshows in the summer. At about 2 miles, the snowshoe path intersects the cross-country ski path from Coldstream Valley. Turning left, you can continue along the nature trail or simply follow the cross-country path along the road back to your starting point at the visitor center parking lot. Directions: From Interstate 80, about 3 miles west of Truckee, CA or approximately 100 miles east of Sacramento, CA, take Exit 184 to Donner Pass Road. Follow Donner Pass Road approximately 1/2 mile west to the entrance to Donner Memorial State Park on the left (south) side of the street. The address is 12593 Donner Pass Road, Truckee, CA 96161. Winter trail map from the State Park website (original brochure can be found here). « Just Like Being There? I dunno, I think if you’re going to visit Donner Park, you really should do it in the winter. Drove through there back in 2011 on our way home from our route 66 – California vacation. Hard to pass through there without having some rather morbid thoughts. Here in Nebraska we are nearly snowless. I really would like to go snowshoeing. Jealous here. Maybe time for a return trip to Minnesota? Did you happen to eat finger sandwiches for lunch during your visit? Sorry, couldn’t resist!